April 4, 2019 By Elise 1 Comment This post may contain affiliate links. Please read my disclosure policy for more info. Want a little boost of accountability? 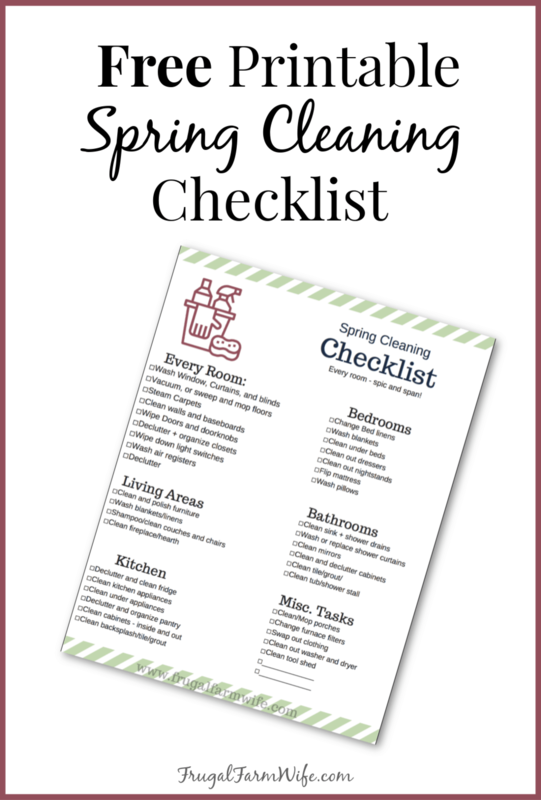 Download this free spring cleaning checklist! Ahhh, spring cleaning. It’s a love-hate relationship. Love having a clean house, hate cleaning it. I’ve asked myself a hundred times why I hate cleaning so much. Is it because the people I live with just make things dirty/messy again within minutes? Or is it the act of cleaning itself. But as much as it pains me to admit, I don’t enjoy it. At all. I hate to even admit that, because, you know, I don’t want to be a poor housekeeper. So, as a cleaning hater, I thought maybe I could share a few things that have helped make the act of cleaning a little more bearable for me. Get Your Spring Cleaning Checklist! Subscribe to get your printable checklist. Listen to an Audiobook or podcast. I know a lot of people talk about putting on some music and getting it done, but for me, I could be listening to music while doing something enjoyable. Music doesn’t really take my mind off what I’m doing. But audiobooks? Podcasts? Those engage your mind, while your body does the mind-numbing work of scrubbing toilets. I usually like to wear my noise-cancelling earbuds if I’m cleaning solo so that everyone leaves me alone. Honestly, when I’m in cleaning mode, I’m just like, get-out-of-the-way-and-let-me-do-this-real-fast. But I have kids to teach. It has taken a lot of work to change my mindset, I won’t lie, but when you change from cleaning mode, to teaching the kids a life skill mode, it completely changes things. You go from cleaning – a useless, repetitive task – to something worthwhile. Yes, the cleaning is slower, but honestly, the point isn’t to clean anymore, is it? Now it’s all about giving those kids work ethic and life skills. It’s a work in progress, but I’m getting there. For real. I really have to do that. Or I’ll forget, or just not get around to certain tasks because I get tired of cleaning. Want your own spring cleaning checklist? And by the way, spring cleaning is no reason to inundate yourself with harmful, immune weakening chemicals. Try cleaning with microfiber cleaning clothes – they’re the best for dusting and greasy kitchen backsplashes! Use Thieves cleaner – it really is the best natural cleaner we’ve ever tried! Open your windows to get some fresh air flow.